Syndication shares are available to Leading AQHA Sire of Money Earners Pyc Paint Your Wagon. WAYNE, OK�AUGUST 26, 2013�The odds of a horse become a grade 1 winner are huge. So are the odds of a horse becoming a prominent stallion. Now, imagine the odds of a horse becoming a grade 1 winner and a great stallion. Now, take it to its maximum. Imagine the odds of a horse becoming a truly great stallion. It was those odds, which Pyc Paint Your Wagon beat on both the racetrack and is beating at stud in such a commanding way that he could become an all time great. Randy Hill, who has managed the stud career of the 2013 AQHA Leading Sire of Money Earners Pyc Paint Your Wagon, has announced the 10-year-old son of leading living sire of money earners Corona Cartel is being syndicated. Bred-and-raced by Michael Pohl, Pyc Paint Your Wagon won or placed 13 of 16 starts, earning $889,581. He won the Texas Classic Futurity(G1), Texas Classic Derby(G1), Heritage Place Derby(G1) and Lazy E Futurity(RG2). He was second in the Rainbow Futurity(G1) and The Championship at Sunland Park(G1). He has been at the top of the leading sire's list since is first crop races in 2010. That year he led all first-crop sires with $1,506,834 in earnings. He followed up his sophomore again as the leading second-crop sire with $3,127,193. In 2012 he become the overall leading sire of money earners with $3,990,899 and he is currently leading all sires with $2,418,644 through August 19. Pyc Paint Your Wagons first crop yielded RG3 winner Freighttrain B SI 115 ($421,761), RG1 winner First Painted Sign SI 104 ($284,911). In his second crop he got G3 winner Cruzin The Wagon SI 106 ($336,869), multiple SW First Prize Jordan SI 109 ($201,469), G3 winner Haulin Candy Salt ($164,328) and stakes-placed Folly Del Rey SI 97 ($160,319). His third crop includes Remington Park Futurity winner Lota Pyc SI 102 ($318,307), RG2 winner Joker On Jack SI 106 ($268,928), G2 winner Runaway Wagon ($133,080), SW/ G1 placed Pyc Kant Katch Me SI 96 ($191,245), G2 winner Top Gun B SI 101 ($128,420), SW Send A Candy Guy SI 101 ($124,687). This season Pyc Paint Your Wagon has sired two finalist to the $2.8 million All American Futurity including fastest qualifier SW/RG1 placed Wagon Tales SI 99 ($165,061) and Wagon Full Of Gold SI 92. In four crops to reach the track, the 10-year-old stallion has sired 245 winners(60%), 43 stakes winners(11%), 43 stakes-placed(11%) with earnings of $11,036,122 and average earnings per starter of $27,250. Pyc Paint Your Wagon is out of the all-time high selling broodmare at auction Dashin Follies who sold for $875,000 at the 2010 Heritage Place Winter Mixed Sale. The daughter of leading broodmare sire Strawfly Special has produced 12 ROM including G1 placed leading sire Ivory James SI 103 ($220,026), G3 placed Follies Bergere SI 95 ($31,198), G1 finalist Cornita Cartel SI 97 ($31,724), all full siblings to Pyc Paint Your Wagon SI 107 ($889,581). She is also the dam of RG3 placed Eye Follies SI 101 ($101,315), etc. 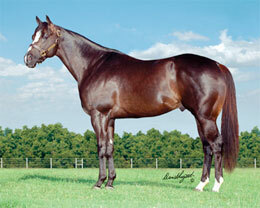 The second dam is AQHA Racing World Champion Dashing Folly SI 108, by First Down Dash. A winner of 12 races, $535,841, she is sister to SW Twoforthedough SI 93 ($114,765) and RG3 placed Hesaspickymeatsaballa SI 98 ($53,788) and half-sister to G3 winner Covenant Confirmer ($46,304). Pyc Paint Your Wagon is owned by Michael and Donalda Pohl of Montgomery, Texas and stands at Royal Vista Ranches, near Wayne, Oklahoma. His 2014 fee has been set at $15,000. For additional syndication information contract stallion manager Randy Hill at 918-774.8338.